Well, gang, I'm pleased to announce that I have come across the Holy Grail of record collecting – at least, to me. Ironically, this Gem comes from eBay, a place where I rarely spend more than a buck for a record. But a very nice fellow was selling a couple hundred LPs for a nominal price, and buried within them was this EP from 1952 (the year of my birth). I just happened to notice it as I was killing time at work going through the cheapo listings on the auction site. 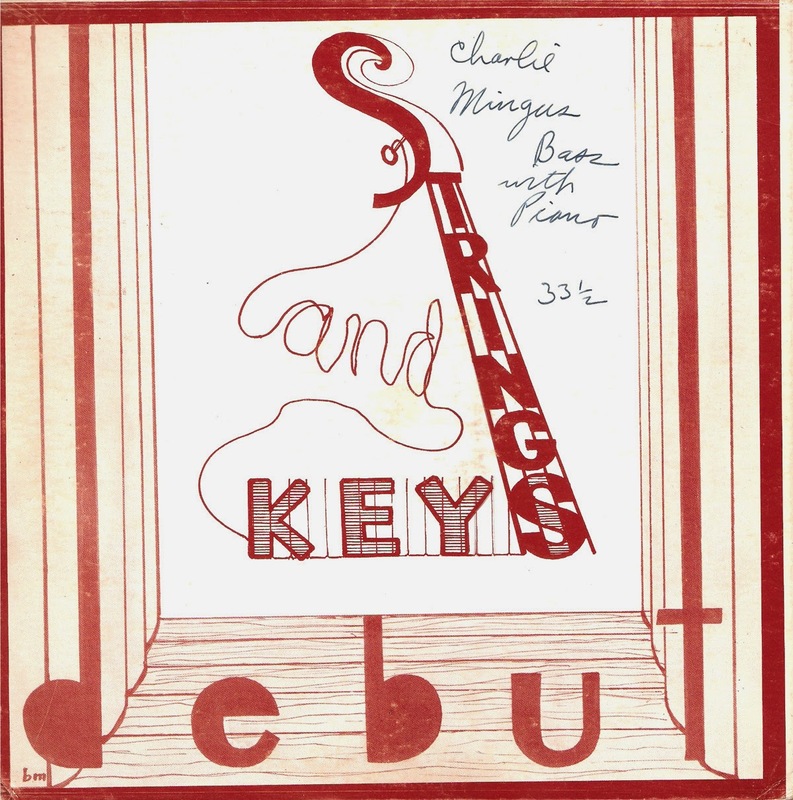 Right there, in one of the photos of a his collection, plain as day, was Charles Mingus' first release on Debut, a record the bassist recorded in the early 1950s with pianist Spaulding Givens. They waxed it for another label but later released it on Mingus' own imprint. 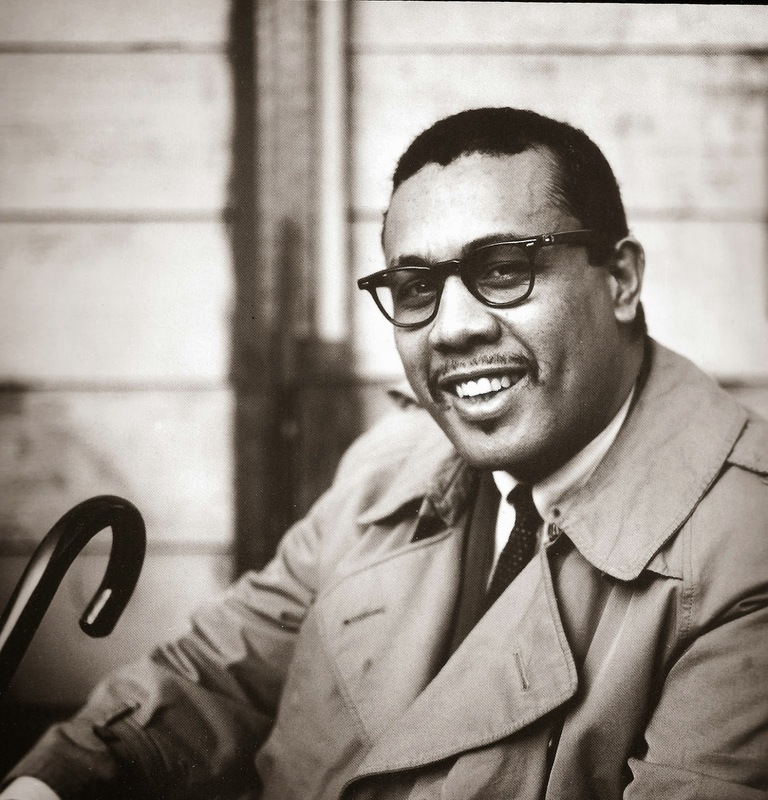 It's historic because it's the first independently-produced record by a jazz artist, and because it's rare Mingus. The initial pressing was probably only 500 EPs. The seller seemed to know very little about jazz, and I was curious about the collection, because much of it was Mancini, Bert Keampfert, Les Brown and other easy-listening stuff. 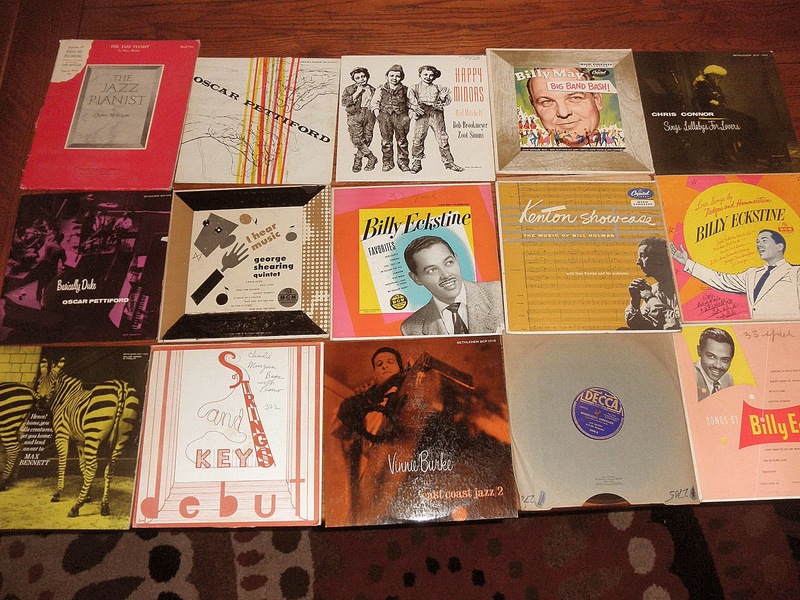 But mixed in were some pretty heavy and rare jazz recordings, mostly by bass players. There were also several bass instruction records. It seemed like an odd mix. When I met up with the seller to make the buy, he told me the collection had been his grandfather's. He said the old gent had been a swing bass player and that he'd played in bands most of his life. He lived in the Corning, NY, area and worked most often with an big band called, curiously enough, the Mohicans. I found listings for them in old newspapers in my newspaper's morgue. Judging by the collection, the bassist started out playing bebop but later switched to the more conventional swing style, probably in an effort to make a little money. Not much call back in the 1950s for "Ooh Bop Sha'bam" in upstate New York, I'm guessing. He bought the easy-listening stuff so that he could practice the popular tunes that dancers wanted to hear. Morello on drums with Vinnie Burke on bass. 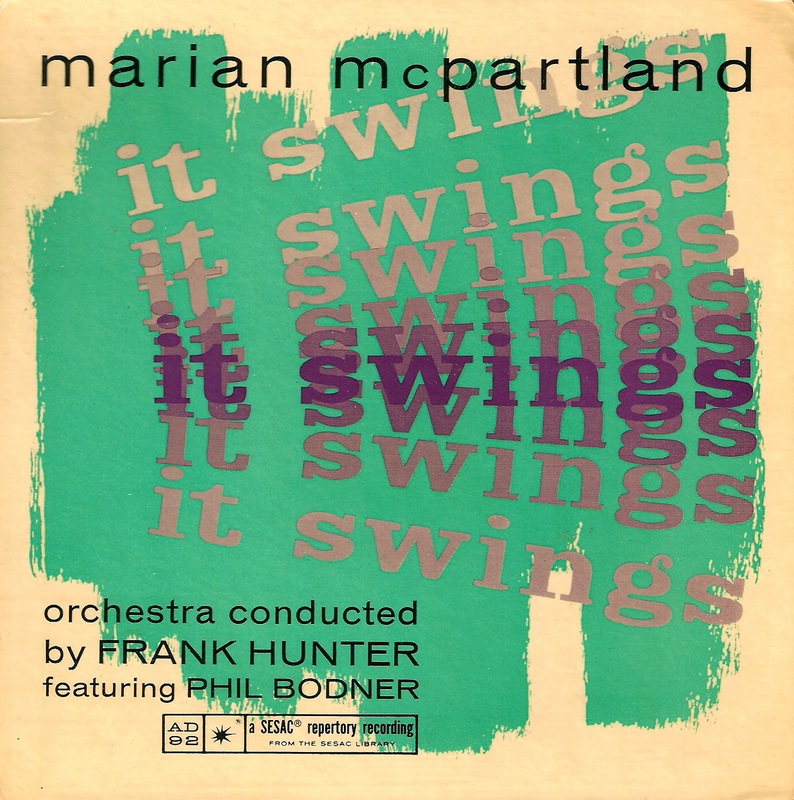 The other gem in this posting is a very rare EP from the late, lamented Marian McPartland. This one also comes from eBay and I don't know why nobody else bid on it. But I got it for 99 cents, and was very pleased that I did. It features Ms. McPartland actually playing some muscular stuff, unlike what she'd been recording for Capitol prior to this date. The strings are here, yes (including the ever-present Harry Lookofsky), but the arrangements by Frank Hunter are a cut above the usual treacle that backed Marian following her London House days. Phil Bodner is also present, playing flute quite nicely. The Sesac label was one that didn't last long, and this little disc features four of the twelve tunes that were recorded on this date back in 1964. There must have been an LP release, but I've never seen it. So here's an extremely rare Mingus recording and another rarity that we offer as a tribute to Ms. McPartland. As always, these files were dubbed from the original vinyl. The Mingus tunes have a lot of hiss to them, but I suspect that's how they sounded when the record was new (the vinyl is visually pristine). The notation on the cover was made by the previous owner – and I left it there as a tribute to him. Dig! 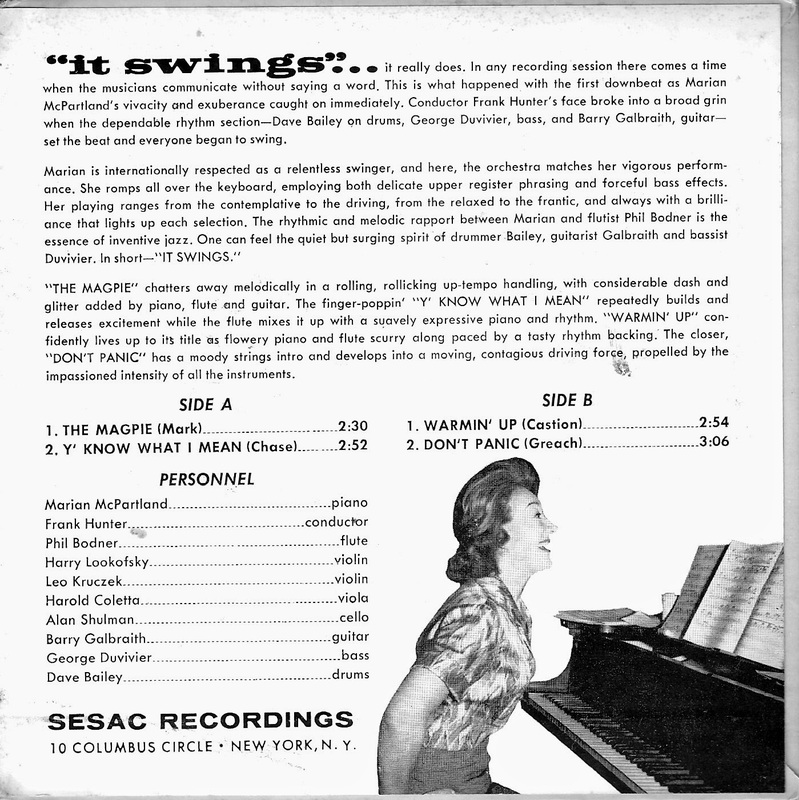 Spaulding Givens, p; Charles Mingus, b.
Marian McPartland, p; Phil Bodner, fl; Harry lookofsy, Leo Kruczek, vi; Harold Coletta, viola; Alan Shulman, cello; Barry Galbraith, g; George Duvivier, b; Dave Bailey, d; Frank Hunter, arr. And you're shocked because I try to find obscure records?! No, Hector -- I'm just amazed at how obscure some of your record finds are! You come up with some truly unusual sides. Hope you enjoy the Mingus. Thank you for Marian! Nice record never heard before. Thanks so much. I can't wait sit on my back porch this rainy evening with a cool bourbon and listen to these gems. Pour one for me, Hook! 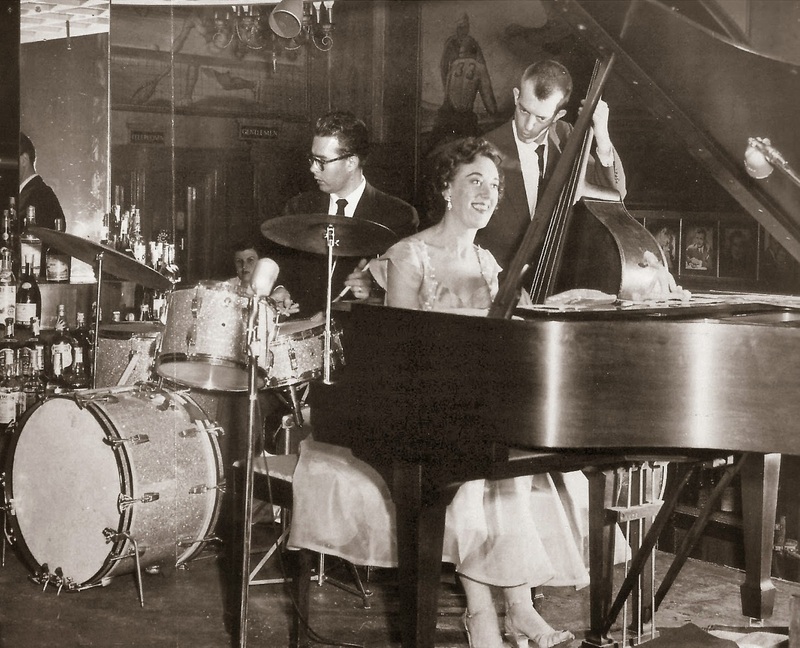 Thanks very much for that Marian McPartland gem! Wow, great find David! Thank you for sharing these nice little gems. Great story as well. I look forward to listening and, per Hook's suggestion, pour a little taste of whiskey and enjoy. Thank you again for sharing. Rare indeed, David. 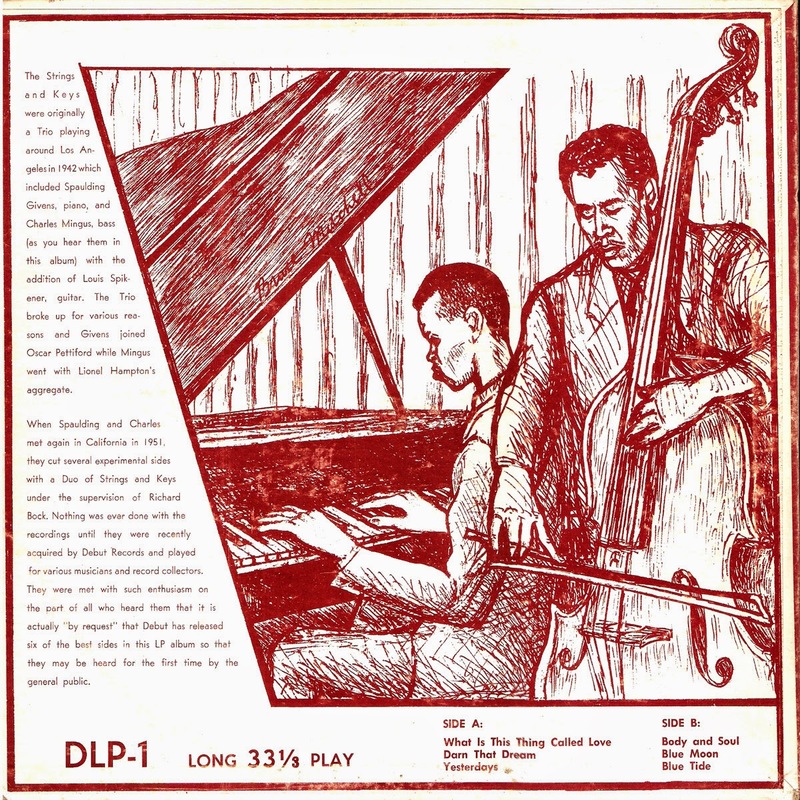 I finally found the Mingus-Givens trio on Debut Rarities 2, but love the back stories you provide.